It wasn’t too long ago when Aerocity was only a lush green land in vicinity of Delhi airport. Soon it became the hot property among hoteliers who built a slew of 5-star hotels in the area for expats, corporates and people looking for accommodation near the airport. And now, the place is brimming with swanky restaurants, shopping marts and eateries. 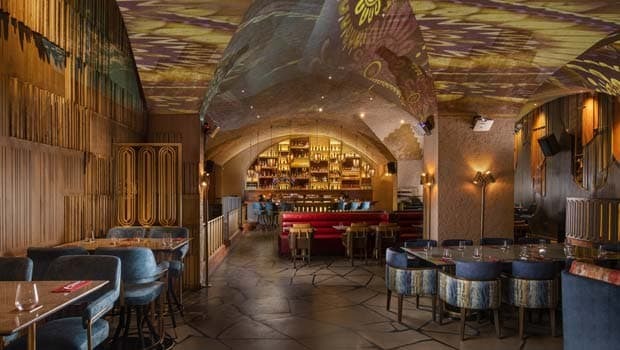 One of the latest additions to this bustling space is La Roca, Delhi’s first world Tapas bar. For the uninitiated, Tapas refers to small bite-sized savoury dishes, served with alcohol at bar. At La Roca, you would find a delicious mish-mash of world cuisine, with dishes and flavours inspired by South America, Korea, Europe, Canada and Japan. We started off with Salmon Carpaccio Asian Thai Naam Pla And Chilli Jam. Yes, that’s a lot of syllables, you may not even get the name right at one go, but do go for it, we insist. It indeed served as a stellar start to our tasting session at La Roca. It was basically, super thinly sliced Norwegian Salmon, topped with thinly cut pineapples, sweetened chillies, parsley, olive oil, ginger and in-house chilli jam. The chilly and tangy flavour of the appetiser was one eclectic treat. Chef Akshay Bhardwaj told us that this particular dish was inspired by South American ceviche. In South American cuisine, raw food in cooked in lot of acidic flavours so that it cuts through the rawness. Then, came the tomato warm burrata and olive oil, softened burrata cheese with crispies and slow roasted tomatoes, served in a bed of arugula leaves, tossed in a citrusy lemon dressing, the salad was a blend of fresh flavours. La Roca houses an amazing range of dimsums, hargao and gyozas. We absolutely loved their lobster and prawn gyoza. Dumplings filled with lobster and prawn, served with a thin and crisp flour dish that adds a welcome crunch. Team it with their coriander, chilli and garlic dip for best experience. Vegetarians can go for their trio mushroom hargao. These were dumplings packed with porcini, button and shitake mushrooms, lotus flour and truffles. The next star dish on our table was the salsa creole pork bao, the taco-styled bao were filled with pan-seared pork belly, smeared with South American salsa creole and barbeque sauce. Chef Akshay told us that through this dish he attempts to bring together the best of many worlds. Salsa from South America, bao from Japan, and the sauces used in cooking the pork, we were told, had elements Canada too. We also tried the enoki ngiri – the show stealer here again was the sheer balance of crisp flavours and not to mention the meticulous presentation. This dish comprised enoki mushroom and pickled porcini, rolled up in ngiri (a form of sushi), tangled in crunchy and coiled flour preparation. For our mains, we went for warm and comforting Truffle mushroom risotto. The deceptively simple looking dish was actually a rich melange of flavours. Rice slow-cooked in a cheesy medley of porcini, button, shitake mushrooms and truffle oil, the risotto was served with flour crispies with a topping of carrot sauce.